Dosai is a new Indian-flavored vegetarian restaurant in Murray Hill, aka "Curry Hill." The menu leans to the south of India. Dosai, 104 Lexington Ave., New York, NY 10016, 212-684-4010. John McDonald is the force behind Sessanta, a new Italian restaurant in the SIXTY SoHo hotel. The chef is Jordan Frosolone, who was previously in the kitchens at Hearth and August. Sessanta, SIXTY SoHo, 60 Thompson St., New York, NY 10012, 212-219-8119. From the folks who founded Italian eatery Malatesta in the West Village comes Spaghetti Incident. Its name is a reference to a Guns N’ Roses album. The new Lower East Side restaurant serves affordable takes on pasta dishes as well as arancini. Spaghetti Incident, 231 Eldridge St., New York, NY 10002, 646-896-1446. Leyenda is a new spot in Brooklyn's Carroll Gardens from famed mixologist Julie Reiner. The focus is on cocktails made with spirits from Central America and South America. The food menu was created by Sue Torres. Leyenda, 221 Smith St., Brooklyn, NY 11201, 347-987-3260. The Clocktower, a restaurant from British chef Jason Atherton, has opened in The New York EDITION hotel. Elevated tavern fare is served in a casually elegant atmosphere. The Clocktower, The New York EDITION, 5 Madison Ave., New York, NY 10010, 212-413-4300. Despite the Italian name, Faro is a seasonal American restaurant from a husband and wife team who has logged time at Northeast Kingdom and Jean-Georges. Expect dishes like sweat pea porridge, wood-fired porgy, and green garlic lumache pasta at this newcomer in Bushwick, Brooklyn. Faro, 436 Jefferson St., Brooklyn, NY 11237, 718-381-8201. An outlet of Mamo Le Michelangelo, located in Antibes, France, Mamo will attract the city's see-and-be-seen crowd from day one. Chef Massimo Sola cooks mostly Italian classics with a few nods to Provence. Mamo, 323 W. Broadway, New York, NY 10013, 646-964-4641. In the space that chef Simpson Wong intended to open a Vietnamese restaurant comes Chomp Chomp, chef Wong's homage to the hawker stands in Singapore. The menu, naturally, will focus mostly on Asian and Singaporean street food. Chomp Chomp, 7 Cornelia St., New York, NY 10014, 212-929-2888. Two kitchen and restaurant vets from Per Se and Locanda Verde, respectively, have opened Virginia's, a bistro deep into the East Village. The menu consists of dishes such as crispy sweetbreads with apricot, roasted duck with fermented soybean, and warm morcilla salad. Virginia's, 647 E. 11th St., New York, NY 10009, 212-658-0152. Landing on St. Marks Place in the East Village is Timna NYC, a spot that focuses on the food of the eastern side of the Mediterranean and beyond. Expect dishes from Greece, Turkey, and even Yemen and Iran. Timna NYC, 109 St. Marks Pl., New York, NY 10009, 646-964-5181. Danny Meyer's Untitled has reopened in the new Whitney Museum of American Art located in the Meatpacking District. With Michael Anthony as the chef, the restaurant serves an array of haute dishes and vegetable-focused offerings. Currently, the hours and opening days may vary. Untitled, Whitney Museum of American Art, 99 Gansevoort St., New York, NY 10014, 212-570-3600. The duo behind The Spotted Pig, The Breslin Bar & Dining Room and other meat-favoring venues, April Bloomfield and Ken Friedman, are opening a four-floor restaurant atop the landmarked 70 Pine Street skyscraper. The eatery will have outdoor terraces for dining as well. Tavern on the Green now has a beer garden. The menu is classic Teutonic fare --- schnitzel, sausages and kraut --- with three beers on tap that can be ordered by the pint or pitcher. Tavern on the Green, Central Park W., New York, NY 10023, 212-877-8684. Dominique Ansel, the pastry wizard behind the cronut and other delights, has unleashed a tasting menu at his newly opened eponymous spot Dominique Ansel Kitchen in the West Village. The eight-course prix-fixe all-sweet meal with cocktail pairings costs $75. It takes place on the second floor of the building. Dominique Ansel Kitchen, 137 Seventh Ave. S., New York, NY 10014, 212-242-5111. Chef Danny Bowien may have scrapped the Vietnamese breakfast service at his Lower East Side Mexican spot, Mission Cantina, but he has very recently put a hamburger on the menu. Only available at lunch, the "hamburguesa" is topped with guacamole, jalapeño peppers and a secret sauce. Mission Cantina, 172 Orchard St., New York, NY 10002, 212-254-2233. The original Shake Shack, the Madison Square Park location that launched a mini-empire of burgers-and-shakes spots, has reopened after an eight-month hiatus and redesign. Naturally, also back is the insanely long line. Shake Shack, Madison Square Park, New York, NY 10010, 212-889-6600. Jean-Georges Vongerichten's restaurants (Jean-Georges, The Mark Restaurant by Jean-Georges, ABC Kitchen, etc.) are partnering with Mercy Corps to raise money for Nepal aid. They will be donating $5 for every bottle of water sold at participating restaurants. Jean-Georges, Trump International Hotel & Tower New York, 1 Central Park W., New York, NY 10023, 212-299-3900. Fine dining aboard Seabourn is about to be elevated to another level with the cruise line's partnership with Thomas Keller (Per Se). Read more about this collaboration on GAYOT. Per Se, Time Warner Center, 10 Columbus Cir., New York, NY 10019, 212-823-9335. The 2015 James Beard Foundation Awards has recognized a number of New York City chefs and restaurants. At this year's awards, held in Chicago, Outstanding Chef went to Michael Anthony of Gramercy Tavern. Christina Tosi of Momofuku Milk Bar won Outstanding Pastry Chef and Batard won Best New Restaurant. Mark Ladner of Del Posto received the award for Best Chef in New York City for the regional awards. 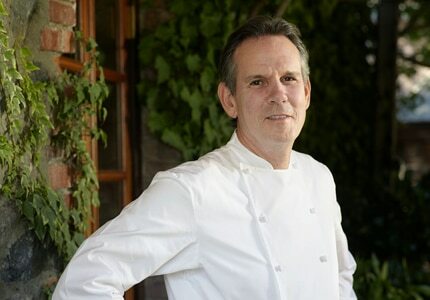 Thomas Keller (Per Se, The French Laundry) has announced that he will open a restaurant in the still-under-construction Hudson Yards, a multi-use space on the west side of Midtown Manhattan that includes shopping centers and luxury apartments. There is little information about the restaurant, only that it will be "classic American." More details to come. Neta, the upscale Greenwich Village spot for Japanese cuisine and sushi, has just debuted a prix-fixe lunch service. Daily from noon to 2 p.m., lunchtime diners can opt for a three-course prix-fixe meal for $35. Choose between one of three starters and then get five pieces of sushi and one roll. Finally, the third course is dessert. The restaurant also offers à la carte dishes at lunch. Neta, 61 W. 8th St., New York, NY 10011, 212-505-2610. Chef John DeLucie is no longer associated with the King Cole Bar. There is no word yet on his replacement. King Cole Bar, The St. Regis, 2 E. 55th St., New York, NY 10022, 212-753-4500. Espoleta, the Spanish spot with a menu created by Sue Torres, has shut down. The space now houses an Italian restaurant. Espoleta, 334 Bowery, New York, NY 10012, no phone. Lan Cafe, the inexpensive vegan Vietnamese restaurant on East 6th Street, has shut down permanently. Lan Cafe, 342 E. 6th St., New York, NY 10003, no phone.